High school all-stars from Pennsylvania and Maryland will compete at the Pennsylvania Scholastic Football Coaches Association (PSFCA) Big 33 Football Classic 62nd game on Monday, May 27th, at Central Dauphin School District’s Landis Field, based in Lower Paxton Township. “We are proud to showcase the country’s premier high school football game featuring so many extraordinarily talented student-athletes, in partnership with the Dauphin County Commissioners,” said Garry Cathell, executive director of PSFCA. Walker’s 19-year-old daughter Peyton died of Sudden Cardiac Arrest. Walker is now working to prevent SCA in students and pointed out that conditions that can cause SCA are often detectable and treatable, yet it’s the number one killer of student-athletes in the country. 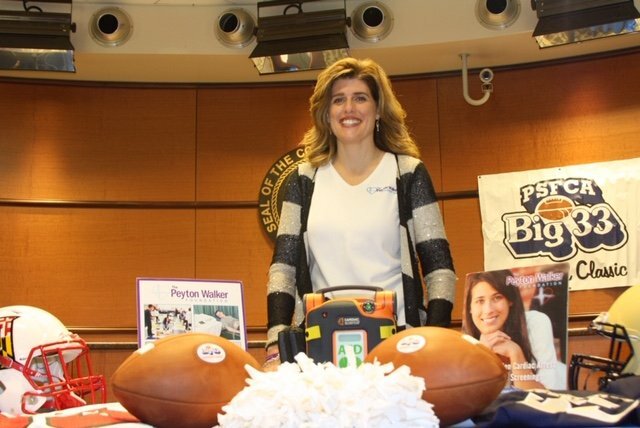 The Peyton Walker Foundation provides free routine heart screenings that help to identify potential heart issues that can lead to Sudden Cardiac Arrest. The game and other events surrounding Big 33 support the Buddy Program, which connects kids with special needs with all-star athletes in football and cheerleading.